Villa Oriole is a six-bedroom pristine holiday home which is located near Bang Tao beach overlooking the hills of Laguna Valley. As part of the private Lakewood Hills Estate, the villa is a luxurious property with ample space for kids and adults alike to run around, languidly lay on the green grass, splash around in the pool, and have a jolly good time. Shades of tangerine find themselves inserted into every aspect of this villa making it even more vibrant and lively to the naked eye. 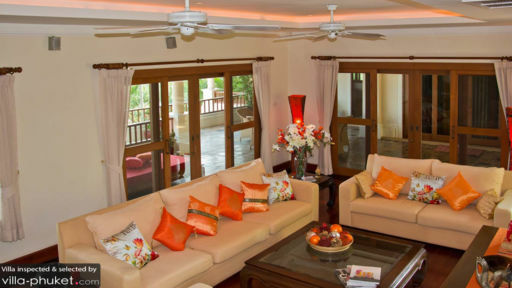 Enjoy an enthralling tropical getaway with loved ones in this serene bit of Phuket! Heading to this charming and opulent property would be in your best interests as it definitely going to be an experience like no other! With six, well-furnished, and air-conditioned bedrooms of which five are king- and queen-bedded master suites, there is much room for everyone, especially if you’re travelling with a large party. Children can enjoy their freedom in the fourth bedroom that has been furnished with single beds and bunk beds! Fitted with flat-screen TVs, sporting large windows beyond which lie splendid flora, and a comfortable ambiance make these bedrooms your private sanctuaries that you can retire to after a long day! En-suite bathrooms are there to save time in the morning, and avoid brawls of any sort. They have been fitted with soaking bathtubs and/or shower areas. The villa boasts of an 18-metre infinity swimming pool that serves as a great vantage point from where stunning views spanning across the luscious foliage of Laguna Valley. With a sea of green to soothe your senses, enjoy a lazy day out an about enjoying the weather while laid out on the sun chairs found on the pool deck. The gorgeous landscape only adds to the whole experience of being in nature, surrounded by it, and wholly immersed in it. A poolside bar serves chilled drinks and concoctions to refresh and recharge! A multi-storeyed structure allows the villa to provide abundant recreational space to guests so you can make the most of your time relaxing and resting. The living area is equipped with TV and exudes a lived-in vibe making you feel right at home, and yet ensconced by verdant vegetation and clean air. Adjoined to the living room is the veranda which is another great spot to take in the scenic beauty of this region. The dining area is located on the same level as the living room and consists of a 10-seater dining table with glass windows that let you gaze at the panoramic views while you eat. The kitchen is fully-equipped with state-of-the-art amenities and even features an island counter for your convenience. A fully-serviced villa, Villa Oriole is perfectly suited for a laid-back and rejuvenating holiday as everything from housekeeping to pool/garden maintenance is well looked after. Personal guest assistance allows for all needs to be met duly! For car or scooter rentals, private massages, and other amenities, you are free to make requests to the staff. Crowned with wild nature, Villa Oriole promises a private vacation spot where nothing and no one will be able to disturb your peace. Further away from the villa is the laid-back Layan beach, home to plenty of seafood and Thai restaurants. Beach clubs like Dream beach club and Nikki are also a fun way to spend your evenings while watching the sunset!